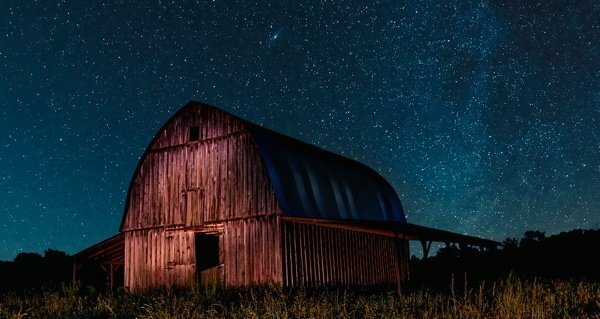 Turns out that the stars above have a lot to do with the iconic red barns that dot the United States. Those ubiquitous red barns dotting U.S. countrysides may now be an iconic American image, but the use of that striking color isn’t simply the result of some stylistic choice. In fact, the use of red paint to cover large buildings isn’t limited to one type of structure or continent. Many public buildings in India can be seen cloaked in that same, unmistakable hue. So why are barns painted red? Because it’s cheap and abundant, and as long as there are still stars in the sky, things will most likely stay that way. As Smithsonian Magazine first reported, red paint is made of red ochre, the oldest known naturally occurring pigment in the world. It’s the primary substance found in the creation of cave art, was used in early religious ceremonies, and beautified both ancient pottery and human skin when implemented to administer early tattoos. Red ochre contains hydrated ferric — or iron oxide, a compound of oxygen and iron — which also makes up that orange/red rust you’ll see on some iron and steel fixtures. Because iron and oxygen are both abundant elements found in Earth’s crust and atmosphere, red ochre can be found in large amounts all over the world, which has allowed for the easy creation and low cost of red paint more than any other color. How does this relate to the stars? In order to answer that question, it’s important to understand just how these celestial bodies work, from birth to death. “…Imagine a star. It starts out its life as a giant ball of primordial hydrogen from the formation of the universe, and under the tremendous pressure of gravity, it starts to fuse,” explains engineer Yonatan Zunger. This nuclear fusion allows a star to be upheld, but once these power levels begin to decrease, the star literally starts to shrink. This decrease in size results in an increase in both pressure and temperature until eventually, an entirely new reaction starts after hitting a high enough degree. The new reaction supplies the star with a huge burst of energy, which aids in the formation of even heavier elements, prompting the cycle to repeat over and over, shrinking and pressurizing as it inches further up the periodic table of elements. That is until it reaches the number 56, at which point the star meets its own demise. Fusion relies on a proton-proton chain reaction, where hydrogen becomes converted into helium. The process goes on for millions of years, in which time nearly all of the hydrogen gets used up, forcing helium to fuse into heavier elements, burning through lighter elements one at a time. As long as the star contains fewer than 56 nucleons it will continue producing energy, but once it surpasses that magic number, it begins to lose it. Thus, once the star hits 56, the process stops producing energy, forcing the star to shut down, collapse, and die. “If the star is small, it will end up as a slowly-cooling cinder, or as a white dwarf. But if it’s big enough, then this collapse will send shock waves through the body of the star which bounce off the star’s core, pushing the collapsing wall of matter outward with more than enough energy to escape its gravity: the star explodes in a supernova, carrying off a good ⅓ of its total mass, and seeding the rest of the universe with elements heavier than the simple hydrogen we started with. The reason that certain heavy elements such as iron are found on Earth can be attributed to the supernovae responsible for the formation of the solar system our fair planet finds itself a part of. In its infancy, the iron found in the Earth’s crust didn’t react to atmospheric gasses because free oxygen simply wasn’t around to oxidize it into a rusty state. As plant life emerged, however, oxygen became naturally released into the air, causing the high levels of iron to rust, eventually forming iron oxide. This process resulted in an abundance of the material, which led to the formation of some of the earliest paints recorded — one that remains an affordable option and can be seen peppered throughout countrysides from coast to coast to this day. So the next time you see a red barn and think of it as humdrum, remember that its roots are actually out of this world. For more of the wonders of the stars after learning about why barns are painted red, head to the Tarantula Nebula, the universe’s biggest cluster of monster stars. Then, check out interesting space facts that make Earth seem positively boring.